Come inside and meet the people who have lived and worked here for 250 years. Those who built it,those who maintained it and those who renovated and restored it. Some,like my grandmother were born here. Others,like my great grandfather died here. But whatever their circumstances, all those who loved and cherished it, remain here. Spiritual imprints in every brick and every plant in the spacious grounds. 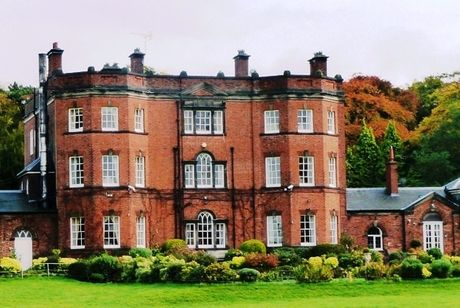 For 250 years,Ramsdell Hall has stood looking out over the Cheshire Plain towards Jodrell Bank and the Welsh Hills. While Randle Wilbraham was building his Gothic Folly at Mow Cop, nearby, Ralph Cartwright was building his Georgian country house. A short distance away is Little Moreton Hall, a half-timbered Tudor Manor, perhaps the best of its type in England. 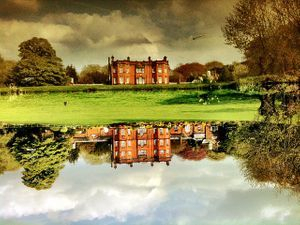 What visual delights in this part of Cheshire. And little did Ralph Cartwright know when he built the Hall, that within a 100 years, there would be a thriving canal to the rear of his property and a railway station a few yars from the impressive front gates. The "Macc" canal is part of the Cheshire Ring of 6 canals, connecting six canals for a circular route of 97 miles, with 92 hand-operated locks. It was opened in 1831. How many people have passed along the canal and gazed up in wonder at the Hall one can only surmise. Mow Cop Station,on the North Staffordshire Railway, was opened in 1848 but closed in 1964,along with so many others. Immortalised in the song "Slow Train" by Flanders and Swann. 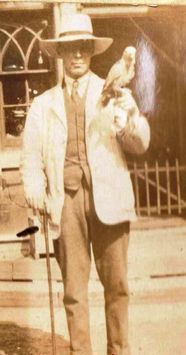 My grandpa Franz knew the station well,as he got off the Manchester train on his visits to the hall just before WW1. Actor Roger Moore nearly bought the hall in 1968 but his wife wanted to be nearer London. 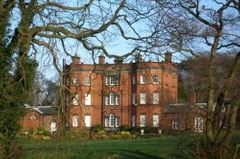 Since then, the present proprietors have given the hall all that it needed and one of the Jewels of Cheshire has never been in better hands. The word "dell" means valley or glen. 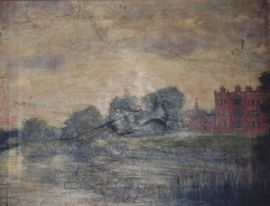 Across from the Hall and the canal, there are sheep grazing in the valley,looking towards Little Moreton Hall and the Lowndes ancestral home,Old House Green. It truly is a most delightful part of the world,not unlike the Stour Valley where I grew up What might John Constable have done with his easel here! There is a village called Ramsdell near Basingstoke and a Ramsdell Theatre in Connecticut ,USA. 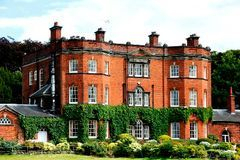 Ramsdell Hall is situated in the township of Odd Rode, in the parish of Astbury, comprising the hamlets of Scholar Green, Kent Green, Hall Green, Rode Heath, Thurlwood and part of Mow Cop. 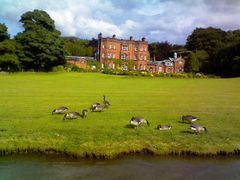 It has spectacular views of the Cheshire countryside, as well as being rather a memorable view itself from the Canal. Most of the building was completed around 1760 by the Cartwright Family, who were major landowners in the area for centuries. This particular branch of the Cartwrights lived at a smaller house called Old House Green, the family's traditional home for some time. It would seem that a Ralph Cartwright started the initiative in 1750s, probably actively helped by his nephew Thomas who later inherited Ramsdell and the estates from Ralph. See the Cartwrights own section. Ramsdell Hall is best described by sight than by words. 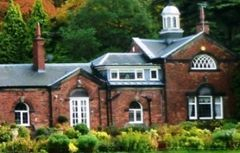 It is one of the major landmarks and mooring points on the Macclesfield Canal and the many photos illustrate why those who behold it, often gasp in wonder at this beautiful, red-brick Georgian building , with its sweeping lawns down to the canal. The irony is that the canal wasn't opened until 1831. One wonders how this magificient house and surrounding gardens, woodland, parkland and two small lakes would have looked before then. Perhaps the ghost of the girl who is said to have lost her life, accidentally killed during a duel between her suitors, could tell us. However, if she did exist, family records and trees do not show who she might have been. 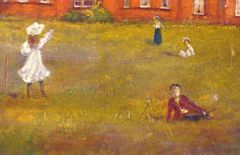 Part of Irene Proctor's 1996 painting of Ramsdell Hall Is this the Ghost of Ramsdell? They were the builders of Ramsdell Hall - with Ralph Cartwright the most likely candidate. He was almost certainly brought up at nearby Old House Green with his brothers John and Thomas. The latter became a clergyman, and moved away from the area - spending his last two decades in Northamptonshire (see his section under the Cartwrights) John stayed in the area, bringing up his family at Old House Green (see his section too) Ralph moved away from Cheshire to the Stoke-on-Trent area, settling in Newcastle-under-Lyme where he lived for the rest of his life. He appears to have remained single until he married Elizabeth Colthurst in 1750. Ralph was 59 and Elizabeth was 42. They didn't have any children. So why did a man happily living in Newcastle, decide to build such a grand house over 12 miles away? Ralph's activities are well documented in various National Archives Documents. He is always referred to as Ralph Cartwright of Newcastle under Lyme, gentleman ... not one reference to Ramsdell or indeed Ramsdale. He seems to be particularly active in the Odd Rode area where he grew up. Living as he did in the urban and industrial Potteries, perhaps he wanted a country retreat. Where better than next to Old House Green itself. Such a new house would be a rather nice stopping-over place before returning to Newcastle. Ramsdell Hall is believed to have been built during the 1750s. Maybe he was originally considering it as his main abode. Perhaps his new wife preferred to live in a more urban environment. One can only surmise. 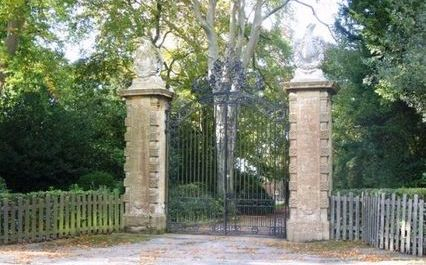 In his will, Ralph left most of his property to his beloved nephew Thomas Cartwright. Perhaps he had Ramsdell Hall built for Thomas. Or perhaps Thomas' father, John, instigated the building of the Hall for the same reason. Either way, Ralph seems to have been the owner of Ramsdell before passing it on to Thomas Cartwright ... sometime before his death in 1778. A newspaper reports a marriage in 1810. "At Astbury, Mr. Thomas Hall, of Hull, to Judith, youngest daughter of the late Thomas Cartwright, esq. of Ramsdell, near Congleton. " One can only speculate who lived there from 1760 until Thomas took up residence ... perhaps Thomas himself did. He had married 26 year old Elizabeth Floyd of Daventry on the 4 Dec 1759 at St Mary's in Astbury. Sadly, she died in 1768. It seems that they had no living children. Therefore, Thomas and Elizabeth may well have been Ramsdell first occupents from 1759 until 1768. 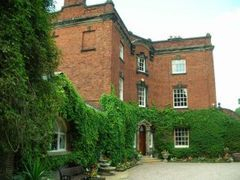 They married on March 31, 1801 at St Mary's Astbury, but did not start their married life at Ramsdell Hall. Elizabeth had inherited the Hall from her father, Thomas, and had been brought up there. Henry, born in 1773, was an Ornamental Stationer and Pencil Manufacturer in Fleet St, London, hence why they started their married life in London. Their first 3 children were all christened at St Mary's, Lambeth. Elizabeth - 28 Mar 1802, Emily - 20 Mar 1805, Ellen 04 Jun 1806. Henry and Elizabeth finally made Ramsdell Hall their family home some time between Ellen's birth in 1806, and their 4th and 5th children's births in 1810 - twins Cordelia and Louisa. They had seven children in total (see Elizabeth's section on the Cartwrights page) Who occupied Ramsdell until Henry and Elizabeth's incumbency is uncertain. Perhaps they used it as a country retreat. There are letters and diary extracts written by relatives staying at the Hall – which form part of The Wyatt Papers. 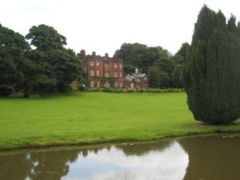 It must have been wonderful for Henry's relatives to come and stay in Cheshire, and to enjoy the surroundings that Ramsdell and the estates offered. The few references to Ramsdell itself date from 1810 onwards. Eventually, Henry and Elizabeth decided that London was their home, and their short time at Ramsdell ended in 1815. William married Elizabeth Hope in 1798, and eventually, they brought up 8 children in the spacious splendour of Ramsdell Hall. 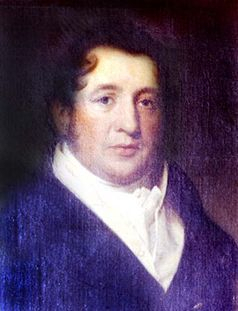 William bought Ramsdell Hall from Henry and Elizabeth Dodds in 1815, and his family became the third one to live at Ramsdell. William twice became Mayor of Congleton and saw the Macclesfield Canal arrive at his door in 1831, complete with ornamental railings that in 2007 were beautifully restored. It was this canal that would not only put his beautiful house on the map forever but would cause it to be leased to the Williamsons, a coal merchant family for nearly half a century. 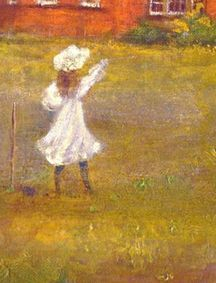 His youngest daughter, Isabella, reputedly a great beauty, was related by marriage to the Prime Minister Sir Henry Campbell Bannerman, who always kept a portrait of her at his home. Sadly she died when only 23. His eldest daughter , Mary, had married James Bury, whom he didn't consider a suitable match. His eldest son, John Hope had disappointed him with his spendthrift ways. Ellen Susannah, his second eldest daughter, died in 1842. As he approached the twilight of his life, he must have given very serious thought as to whom he could best entrust the family estates to. 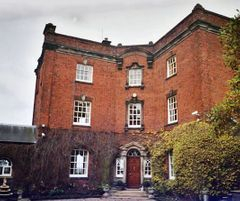 Following the death of his wife Elizabeth and the leasing of Ramsdell to the Williamsons, William moved into Old House Green, where he died in 1844. But not before dropping a family bombshell, by disinheriting his eldest son John Hope and leaving the estates to Elizabeth! How surprised she must have been, not to mention the rest of the family. By the terms of the will Elizabeth and her husband William Chaddock had to add Lowndes to their surname and thus the name Chaddock-Lowndes was born. However,although Elizabeth now owned Ramsdell Hall and the Farm Estates,she wouldn't herself live there again. 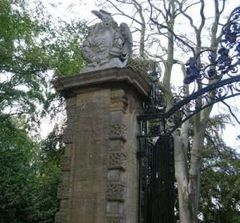 Nor would her children, until her son Thomas Chaddock-Lowndes took up residence in the late 1880s. Ramsdell Hall's sleepy existence was about to take up a new challenge and shake-up. 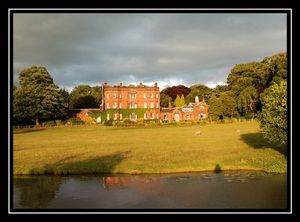 The Macclesfield Canal brought the Industrial Revolution to rural Cheshire and the Williamsons of Middlewich to Ramsdell Hall. Robert and Anne and their sons owned various coal and iron works in the area and what better place to live in and work from than Ramsdell Hall. 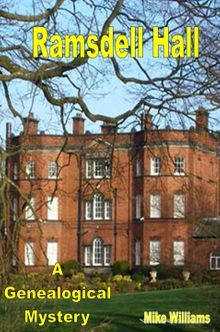 William Lowndes' children, presumably, didn't choose to take up the Hall and with his moving to Old House Green, it was leased rather than sold. It may also have been so that William chose to lease out Ramsdell rather than offer it to any of his children. 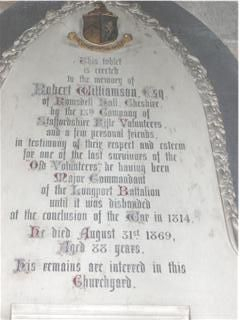 He earned a similar tribute from the 13th Company of Staffordshire Staffordshire Rifle Volunteers and these can be found at Astbury Church. His sons Hugh and Edward continued the business, listed as Iron Masters in the 1871 Census. 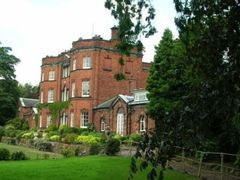 By 1881,Hugh had married Mary and they are the last Williamsons to live at the hall with Edward having moved on.It had been over 30 years since there had been a Mistress of the Hall. Like Anne before her, Mary's time at the Hall would be cut short. Soon the Lowndes would once again reside at Ramsdell with the the time of the Chaddock-Lowndes drawing near. 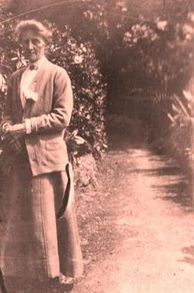 When Elizabeth Lowndes inherited her father's estates in 1844, she was living in Congleton with her husband William, a wine merchant. 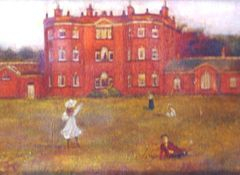 Although she now owned Ramsdell Hall,she was never to live there, although she did eventually live in Old House Green in her later years. Her first 2 children died in their infancy but eventually Isabella, Thomas, Hope, and Lucy came along. Husband William had passed away a few years after Lucy's birth in 1844, a relatively young man. Elizabeth now lived with her father-in-law, Thomas Chaddock, in Congleton, together with Hope and Lucy. Thomas and Isabella were at boarding school. After some time in Hastings, she settled in Old House Green in what tended to be an all female household. Thomas had long since made his own way in life as a solicitor. Following his mother's passing in 1882, he got together with his sisters and paid this tribute to her at Astbury Church, a brass that I and my own sisters have had the pleasure of viewing. "To the firm memory of their Grandfather and Grandmother, William and Elizabeth Lowndes of Ramsdell Hall and Old House Green in this parish; also to the memory of numerous relatives who are interred in this Churchyard, and to the beloved memory of their Father and Mother, this brass is placed by Thomas Chaddock-Lowndes, Isabella Sarah Hope and Lucy Elizabeth Chaddock, October 1883." And so an era was over both in the family, and soon at Ramsdell Hall itself. Thomas Chaddock-Lowndes and his wife Emilie were about to introduce their children Rosalind and Thomas to their ancestral home. Hastings had been pleasant but now it was time to replace saltwater with the freshwater of the Macc Canal. Thomas, retired from his solicitor practice, was now a country gentleman, free to engage in some of his passions such as Horse Riding and Greek Mythology. Indeed, in 1891, he named his twin girls, Ione and Iris! They must have been very special to Emilie and himself because the previous year, after 17 years without issue, Pauline Grace had been born but died 3 days later. 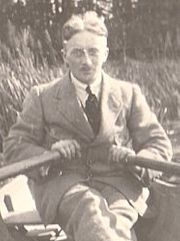 Roderick was born in 1893. So the move to Ramsdell Hall had encouraged Thomas and Emilie to expand their family and ensure the Hall felt lived in. 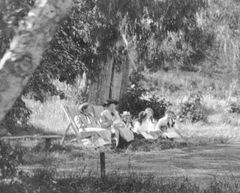 How my grandmother,Ione, must have loved growing up in such surroundings, along with Iris and Roddy. Tommy,never married but took on the responsibilities of the 5 farms. He had a passion for motor racing and was a frequent visitor to the Isle of Man Races. Rosalind married a local sexton,Francis Cartlidge, in 1894 but he died 4 years later. 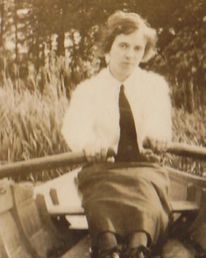 She went on a cruise to Australia just 6 months later but the ship, the Loch Sloy, hit rocks off Kangaroo Island, and poor Great Aunt Rose perished in the sea. A tragic end to Rose and Francis' young lives. 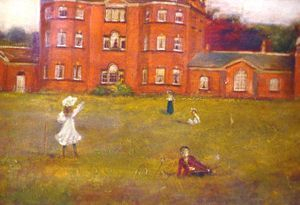 Emilie was already 40 when her 3 Ramsdell Hall children came along, and their 4 children were not born till after her death in 1918. Thomas had died 6 years earlier, so they never met their grandchildren. She painted a remarkable oil of Ione which remains in our family. The family fortunes were now in decline and soon Ramsdell Hall would pass out of the family. My grandfather made his entry into Ramsdell Hall history just before the death of Thomas Chaddock-Lowndes. He was courting Ione and although he was well-received as a guest, he was not seen as a future son-in-law. His stories to me of skating at Rode Heath, nights-out at Hanley Music Hall, and generally loving life at the Hall, filled me with wonder. He went into the Airforceduring WW1 but came back to Ramsdell after the war to marry his Queenie, as he called my grandmother Ione. My mother Ina and Uncle Alastair thus came into the world. And eventually me! Iris and Roddy were married on the same day in 1925, by which time Ramsdell Hall was passing out of the family's hands. 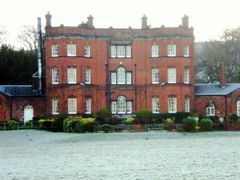 Tommy had done his best but the combination of death duties and dwindling fortunes meant that after 160 years, the Hall was no longer owned by the Lowndes. This section is dedicated to those who not only lived at the Hall but worked and served there. From the 1841 Census we meet Sarah Jones,Elizabeth Eaton, Hannah and Mary but don't know their respective duties. In 1851, we meet Henry Blagg-footman, Anne Fallows-kitchen maid, Anna Dodds-housemaid, Car Eccleston-cook and the housekeeper, M.A.Ibbs. By 1861,William Beresford is the footman but living close by at Ramsdell Lodge. There are two housemaids now,Ann Rigby,29, and Elizabeth Stubbs, 27. Anne Stubbs,23,is the kitchen maid. Alice Goodman,32,is now the cook,a position she is to hold until the Williamsons leave the Hall.Originally from Footsway in Kent, what stories she could tell us from her 30 years spent there. Joining her by 1871 at the Hall are Julia Lawton, 23, and Ann Beresford, just 15[daughter of William the footman] Only Hugh and Edward are left of the Williamsons there but by 1881, the house and Alice has a mistress at last with Hugh having married Mary.Fanny Richards, 26, and Emma Dale, 29, are taken on as housemaids and Alice Ball, 26, as ladies maid.Annie Broadhurst, 27, supports Alice as kitchen maid. Once again,Ramsdell is full of people! A new and very young domestic staff arrives with the C-Ls. 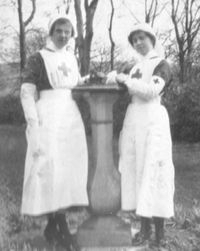 Ellen Johnson,17, becomes cook with her older sister Emma,23, as parlour maid. Mary Mart,16, is housemaid and Thomas' love of horse-riding brings Sydney Francis,17, in as groom. With the twins born in 1891 and Roddy,1893, what a young, vibrant household it must have been. The old hall must have wondered what was happening! The 1901 census only lists Jane Brough,16, from Tunstall as a living-in domestic. Perhaps so much youth had been too much or our young domestics had started their own families.